Snapchat ads for mobile apps are a promising new frontier for app marketers. Snapchat presently boasts 158 million daily active users and nearly 300 million active users. More than two billion Snaps are clicked daily and it is one of the fastest growing social media channels on the web today. Snapchat forged ahead of Twitter in 2016 in the US, and experts presume that the channel will experience a similar surge through 2020. Half of new users in the US are aged 25+ years, according to news reports. The company has released advertising options one at a time to prevent ads from flooding people’s feeds. In October 2014, Snapchat first announced that users would start seeing ads and Samsung offered the first paid placement to run on the platform. On February 2016, Snapchat played its first mobile app install ad. And in June 2016, it formally released its first ad partner program, an official ad API that allowed third-party ad networks to develop and serve relevant ads on Snapchat. Snapchat then initiated self-serve advertising to 400+ brands soon after in September. This year before its anticipated IPO, Snapchat rolled out a new API and gave permission to marketers to license its tech for self-serve buys. Most importantly for those interested in Snapchat ads for mobile apps, they introduced goal-based bidding for app-install ads in April of this year. Targeting on Snapchat has not reached the level of Facebook since the founders are not in favor of retargeting. However, you can target users by location, age, gender, device, and network carrier. The company is soon to announce a feature based on “sequential messaging” that works with an already engaged audience. Snapchat offers goal-based bidding for app-install ad campaigns, where Snapchat only shows the ad to users who are most likely to download the app. CTR is easily measurable with Snapchat. Snapchat indicates that its Snap Ads have resulted in 5x higher clicks compared to other platforms. Additionally, Snapchat’s relatively new, self-serve ad manager allows brands to put up their ads directly. Snapchat also allows A/B testing for advertisers to test different ads based on performance. To excite Snapchat users and even to generate buzz, Netflix distributed 10,000 coffee cups with a scannable Snapcode to cafés around the US. Users could use the Snapcode to unlock access to the popular TV Series Snapchat Filter. The reason it worked was that it was interactive and powerfully built around value. 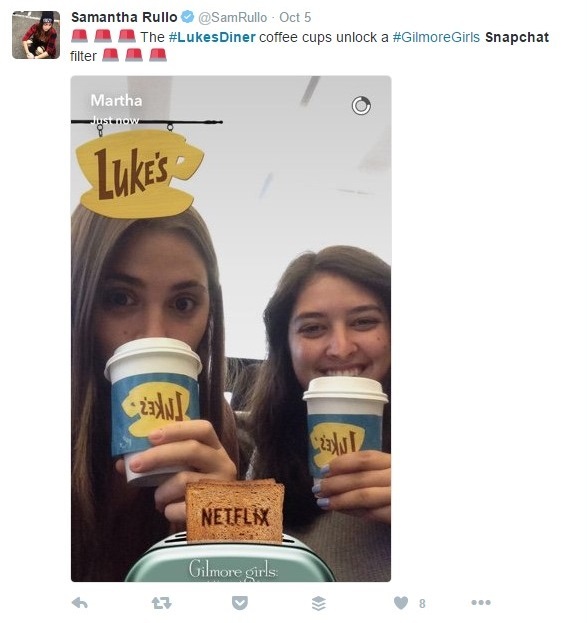 Netflix gave the fans of Gilmore Girls a free filter, along with free show merchandise proactively, thus expanding user reach and existing base. The campaign also led to positive sentiment of its target audience and did not ask for engagement and interest as many other campaigns do. 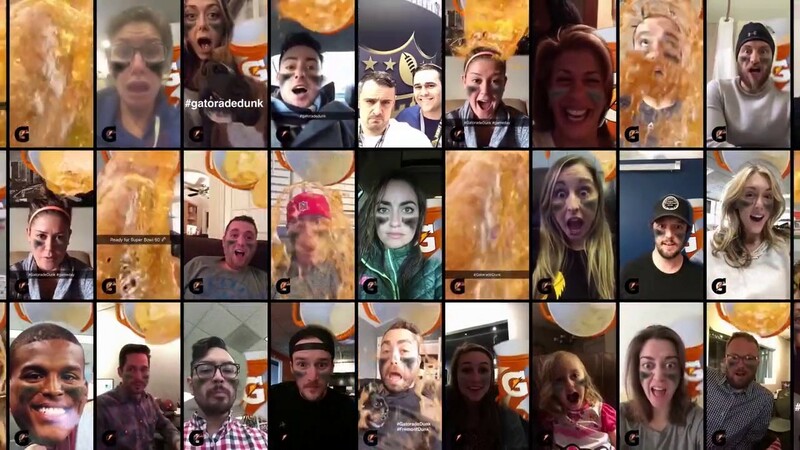 During Super Bowl 50, Gatorade attracted attention by developing a sponsored Snapchat lens that was targeted to American football fans and completely custom made. The #GatoradeDunk campaign simulated the lens as being “dunked” with Gatorade, and the lens itself was promoted with an advertisement starring Serena Williams, one of its sponsored athletes. Over the course of the weekend, the campaign grabbed 100 million views while the total view count hovered at more than 165 million. The campaign worked since the fun, interactive lens engaged football fans to feel a closer connection to the game they loved. The success led the brand to repeat the campaign in 2017 again in a different style, letting users dunk themselves as a sign of celebrating victory. Snapchat introduced self-destructing messages as its defining feature when it was launched. 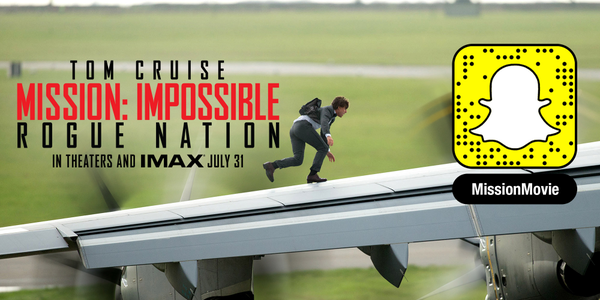 The same feature was leveraged at the beginning of every campaign story used for promoting the movie Mission Impossible: Rogue Nation. Fans were exposed to a “mission month” featuring challenges that had a day’s time limit. Each mission included a Tom Cruise voiceover and a self-destructing Snap. The campaign attracted submissions from different social channels, and the best ones were rewarded, encouraging further participation. The campaign earned a staggering 65 million impressions across multiple social channels. When it comes to Snapchat ads for mobile apps, goal-based bidding for app install campaigns are charged per thousand impressions to accommodate a wide range of budgets. Snap Ads campaigns start at $3,000/ month in ad spending, without agency fees and creative creation costs. Snapchat Sponsored Lenses are priced for each day of the week. They are known to cost $450,000 per day from Sunday to Thursday, and priced a bit higher for Fridays and Saturdays. It costs a staggering $700,000+ for specific holidays or events. Snapchat Discover Ads start at a rate of $50,000 on a daily basis. Sponsored geo-filters are one of the cheapest approaches.The price is dependent on the desired location and period of the geo-filter. National geo-filters are priced at around one-fifth of the cost of Sponsored Lenses. Local geo-filters can be as little as $5, and special events can drive this price up to $20,000 for one hour. A geo-filter can cover about 20,000 square feet to 50,000,000 square feet. Juned Ghanchi is co-founder and CMO at IndianAppDevelopers Company. He guides a range of organizations, from name brands to startups, through the development of top-notch mobile applications.